Kasey was born in Alaska and raised in Billings, Montana. She graduated in 2011 as a Presidential Leadership Scholar at the University of Montana in Missoula with a degree in Education. Growing up in the world of adventure travel, it was only natural for Kasey to jump in to the family business upon entering “the real world”. Currently, Kasey works full time at Austin Adventures as the Vice President of Operations. This allows her to work closely with AA’s U.S. and European guides as well as tour operators worldwide. Due to a full-time office schedule, Kasey’s guiding days are more limited than what they used to be, but she still jumps at the chance to hop on a tour whenever possible. She’s guided trips across the western US and travels abroad (usually to attend adventure travel conferences or study “future trip territory”) on a regular basis. In her free time, she enjoys hiking in Montana’s beautiful mountains, competing in triathlons, reading, and fishing with her dad. Kasey was honored as the world’s top family guide in 2014 by OUTSIDE Magazine. This year, OUTSIDE tapped its global network of correspondents who traveled across America, to Belize, Switzerland, Italy, and beyond identifying the best guides, lodges, adventures, hotels, getaways, and more. Kasey was chosen as one of the top 8 guides in the world, winning in the family category. Anywhere in the mountains at any time of year. Outside of the US, my favorite country on the planet is Peru! What is your favorite historical site, castle, museum, etc.? The Museum of the Rockies in Bozeman, MT. Mooney Falls in Havasupai. This is the most unique hike I’ve ever done and it’ll always stand out to me due to its distinctiveness. At one moment, you’re literally climbing in and out of a travertine wall using only ropes and chains to keep yourself upright and the next you’re “swimming down the trail” jumping over small waterfalls that serve as obstacles. It’s SO cool! The Mickelson Trail on AA’s South Dakota Adventure. It’s 110 miles of biking an old railroad turned crushed limestone trail in the beautiful and secluded Black Hills of the Mount Rushmore State. Its hundreds-of-years-old Ponderosa pine trees, quaint towns, red rock canyons, and wide-open hay fields draw almost no attention and you might see a handful of bikers using this world class path. I get asked this question a lot! 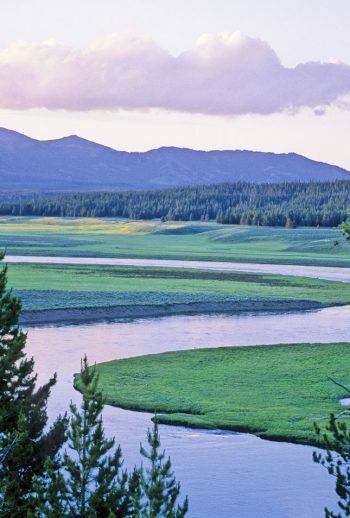 I love guiding our Yellowstone-Tetons Adventure. 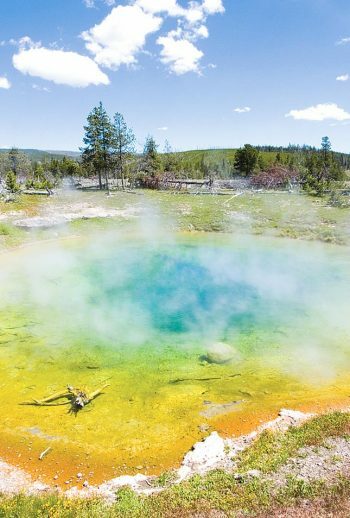 This trip showcases two of America’s most beautiful national parks and they are completely different worlds. 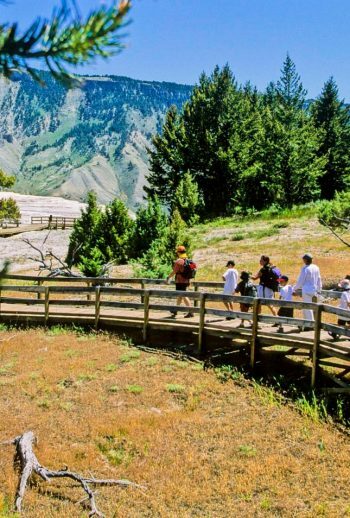 Hiking the back trails of Yellowstone, biking the paths of the Tetons, rafting the almighty Snake River, and kayaking the pure and pristine Jackson Lake just add to the overall majestic feel of the area. It’s so neat to be able to compare with our guests two of our world’s side-by-side treasures, Yellowstone and Grand Teton National Parks. Describe the most amazing experience you’ve had while guiding a trip. Many of my favorite experiences have to do with kids, my favorite guests! Most of my most memorable experiences involve watching kids spot their first wolf, bear, or bison. They get so excited and it’s contagious for the entire group! When I was six years old, my dad bought into this business. I’ve loved to travel and adventure ever since! I LOVE hiking anywhere and everywhere – but especially with my husband, Ryan and my dog, Bruno Mars!